Flags. They had become the latest automotive displays, fluttering atop cars – sedans and pickup trucks, SUVs and smart cars – in crazy abandon. The tiny flags caught my eyes in the summer of 2012, as I drove around Mississauga, the Toronto suburb that was my home. Canada Day, the official holiday to celebrate the unification of three colonies into a single country called Canada, was still nearly a month away. So the sudden show of patriotism puzzled me. As the Euro soccer mania gained momentum, television news channels in Toronto didn’t have to send correspondents to different European countries to get viewer reactions. Nor did they pick up news feed from international agencies. That’s because Europe itself lives in Toronto – people of European descent form the largest bloc of immigrants in the city. 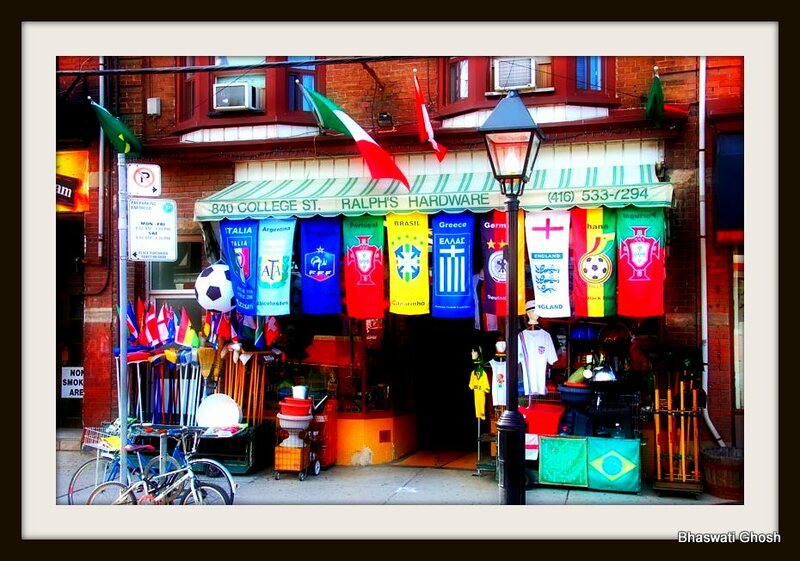 When Italy entered the tournament’s final, the TV channels needed to do little more than to place a camera in Toronto’s Little Italy, where all hell had broken loose as fans erupted to celebrate their home team’s victory over Germany in the semi-finals. My own move to the land of abundant maple syrup and universal healthcare marked a diagonal shift in more ways than one. From the sun-dappled mountains of San Francisco, California, my husband and I decided to come to Canada as landed immigrants. ‘You will like it in Canada,’ he had reassured the writer in me, while we were still contemplating the move. His observation alluded to his comparison of the US west and east coasts (the latter being closer to Toronto). Occasional work-related trips to certain parts of New York exposed him to the thriving diversity there, manifesting in a rainbow of costumes in the streets, words from different languages drifting into one’s ears as well as the vibrancy of the region’s arts and literature scene. That was all I could do, Mohsin, given my nearly non-existent knowledge base of European flags. Please let me know how you like the whole essay. Thanks!